Recently I had the chance to watch Louie Giglio’s Laminin talk. If you’ve never seen it, Giglio spends time talking about how huge our world is. He compares the earth’s size to the size of some of the stars in the universe. His reference for the earth is a golf ball. As he describes the size of these stars we’ve found, he tells us of one who, if the earth is a golf ball, would be a school bus full of golf balls. Then he tells of a bigger star, one that, if the earth is a golf ball, would be the width of two Golden Gate bridges. To top of his illustration, he introduces the largest star ever found: Canis Majoris, the Big Dog Star. If the earth were a golf ball, Canis Majoris would be the height of Mount Everest. That’s a big dang star. As I listened to Giglio speak, he reminded me how big the universe is. When I thought about how big the universe is, I remembered how small my view of God is. If I believe the same God who created me created all of everything, why do I ask him for only things I can wrap my head around? Why do I pray prayers asking for just enough to scrape by? Is it some form of forced humility? The truth is I don’t pray those prayers because I’m scared I’ll get my hopes up and God won’t deliver. 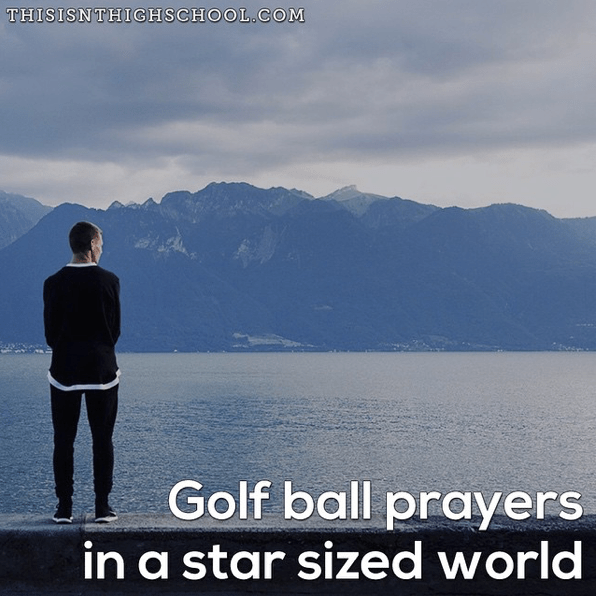 Praying golf ball prayers is easier because, in my mind, they’re more likely to happen. I pray for God to provide enough to get by because then I at least have what I need. What would happen if we asked the God who created the universe to do Big Dog Star sized things in our life? What would happen if we asked for giant things, not for our benefit, but for us to be able to brag on how big our God is? 1) For my new business to replace both mine and Nicole’s income by the time the baby gets here. We want Nicole to have the chance to be a mom first and not have to work. If she chooses to work once we have the baby then it’s because she wants to, not because she has to. Instead of praying for God to provide enough for us to simply eat, I’m going to ask him to provide enough for our family dream to happen. 2) To be able to pay off all student loan debt in the next 5-6 years. Not only do I want enough to allow Nicole to be a mom first, I want enough to pay off my $60,000 in school debt. I want to be able to be a family that is able to do what God tells us to do. With the mountain of school debt gone, we will have more financial freedom to follow wherever he leads. 3) That my daughter would know who God formed her to be from an early age. I want my baby to know her identity in Jesus from the get go. I want her to never have to question who she is or what she’s supposed to be. I want her to know she’s loved, chosen, and a child of the star sized God. Those are my star sized prayers. If your God was big enough to create stars so big they make the earth look smaller than a golf ball, what would you ask him to do? I do the same thing. Play it safe because then you don’t have to deal with the disappointment. My big star prayers would include JOY in the journey — not just survival. Also moving from an attitude of “me first” to service in all I do (parenting, writing, etc. ).